Early Bird Hotel Information Is Here And Open! 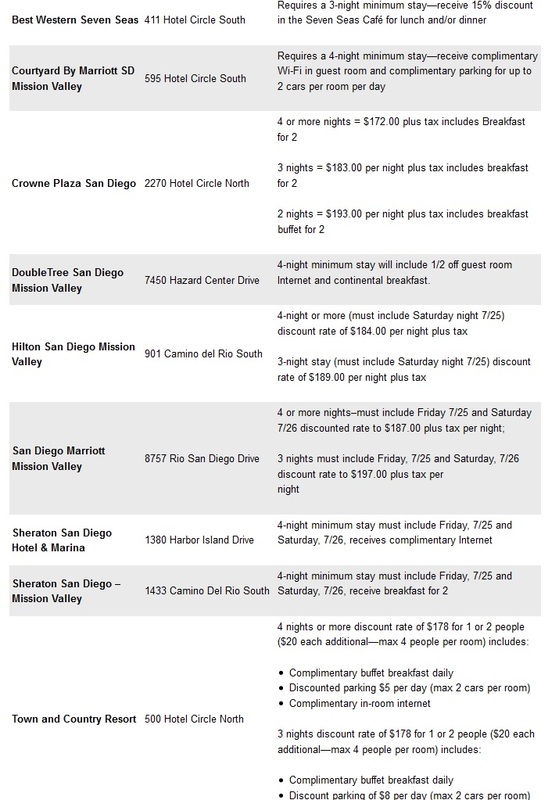 CCI has released information about the Early Bird Hotel options! If you know you will be attending Comic-Con, and you want to save money AND get your room in advance of everyone else, here’s your chance. Please read all the information on this page before clicking the link at the bottom to reserve a room. A limited number of Mission Valley and Airport area hotel rooms will be made available for this special Early Bird Sale. You must pay for the room in advance and there are no refunds or exchanges. Please note: No downtown hotels will be available in this sale. This special Early Bird Hotel Sale is only available BEFORE general housing opens. All rooms must be paid for in advance and are non-transferable. THERE ARE NO REFUNDS. Each room reservation requires full prepayment at the time of booking. The full prepayment is NON–REFUNDABLE, regardless of circumstance. You must be over 18 years of age to book a reservation. The “Comic-Con Early Bird” rates expire on April 8, 2014, or when all available rooms are sold. Reduction in room nights will not be eligible for refunds. If you do not check in on your scheduled arrival date, the hotel will consider your reservation a “No Show” and your entire reservation will be forfeited, along with your entire prepayment. Within 2 weeks of your arrival date, please contact the hotel directly for any date changes. I will be the first to admit that from the moment I saw a trailer for this movie, when I went and saw Carrie, I knew it was going to be horrible. A January movie (a month notorious for bad films), with cheesy one liners thrown in everywhere, and a plot that looked incomprehensible, how could it not be bad? Well I saw it, readers. It was everything I thought it would be–the plot was strange, character motivations bouncing all over the place, and dialogue occasionally cringe worthy. The plot revolves around the titular Frankenstein’s monster, dubbed ‘Adam’ (played by Aaron Eckhart), and his soul-less self being dragged into the demon vs angel war. As…happens with most supernatural creatures, of course. And like most supernatural-creatures in movies such as this (think Constantine), Adam want’s nothing to do with this. He doesn’t like humans, he doesn’t like demons, and he doesn’t like the Gargoyles. Yes, you read that right, the Gargoyles on the Notre Dame are actually the protectors of humans, heavenly emissaries put into duty by the Archangel Michael himself. Their Queen (Miranda Otto) has some of the most inconsistent characterization, changing her reasoning/decisions regarding Adam more than once, without really explaining the situation. Bill Nighy, confirming once again that he no longer plays anything but scene-chewing villains, plays the head of the demons, Prince Naberius. He’s wonderful to watch in this, as always, though I would have liked to see a bit more of him. His plot, and the reason that Adam is brought into this entire foray, is that people brought back from the dead do not have souls. And these demons can only possess soulless creatures. So hey! Finding out how to reanimate corpses, like Adam is, would make for an awesome, unstoppable army! And so the main conflict goes. There is also some plot/love interest/romance dealing with a scientist in Naberius’ employ, but her character is not well defined, and doesn’t really ‘do’ much but show Adam that humans aren’t all horrible people. The fight scenes were quite fell choreographed, with little reliance on slow motion, which was greatly appreciated. I also thought the graphic/sfx work was nice, as well. As a whole, the movie will never be remembered as anything very remarkable. But if you’re looking to turn your brain off and just enjoy some dumb slock for a couple hours in an afternoon, I say it’s worth it. 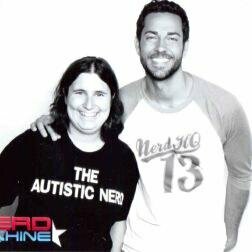 What happened Tuesday afternoon to Zachary Levi was a moment to remember. Nerd HQ, the fan-favorite event held in the Gaslamp District across the street from San Diego Comic-Con, just held their third event last July. Interest in the event has grown steadily every year, with its intimate celebrity-studded panels, large donations to the charity Operation Smile — last year’s event raised more than $215,000 — and ultra-cool hangout reputation. It’s the hottest ticket at Comic-Con outside of an actual SDCC badge. 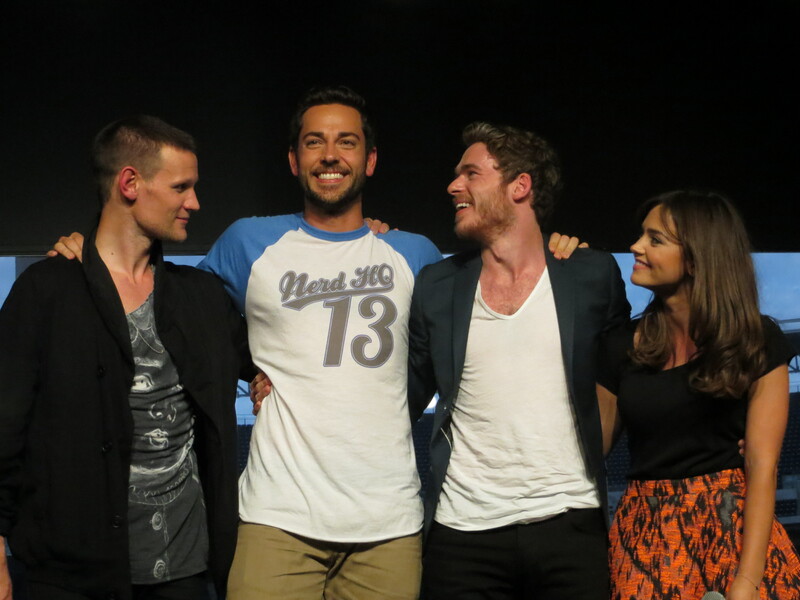 But within just a few hours of asking for help, #IWantMyNerdHQ was trending globally. Levi spoke with The San Diego Comic-Con Blog about the experience. The Nerd Army, the nickname for fans of Levi’s Nerd Machine geek-lifestyle clothing line, rose to the occasion. Fans shared memories of the annual dance party, of their favorite panel moments like last year’s Tom Hiddleston’s Velociraptor impersonation, and more. Many celebrities also joined in on the action after receiving texts from Levi asking for their help, stars like Adam Levine, Rob Krazinsky, Seth Green, and Fillion — who “all day just keep retweeting and kept going and kept fighting” to draw attention to the hashtag and cause. Zachary Levi with panelist Richard Madden and surprise guests Matt Smith and Jenna Coleman in 2013. But the hashtag wasn’t simply a way for Levi to remind his fans that we’re only a few months out from the fourth annual Nerd HQ — but also to help ensure this year’s event is even better. By showing how strong the fanbase of Nerd HQ is, Levi is hoping to attract bigger names, and more money to make the event even more awesome. “I just felt like it would be a fun way to start the journey this year, to tell sponsors and studios and networks and celebrities and fans alike, that either have or have not experienced what Nerd HQ is, and say hey — this is what it is. These are just little snippets. 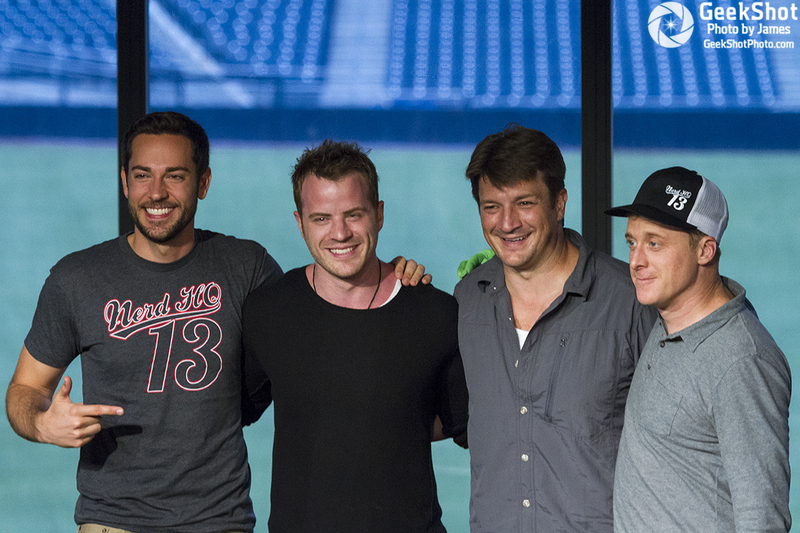 These are just snapshots from various people about why they love Nerd HQ,” Levi said. Levi is hoping that those snapshots are enticing to potential sponsors. Previous years’ sponsors have included Xbox, Intel, Asus, and VIZIO, among others — but as the revenue generated from ticket sales for Conversations for a Cause and other events at Nerd HQ (like Signings for Smiles or Smiles for Smiles) goes to charity, in order to continue growing, there’s always a need for new revenue from sponsors. One of the major selling points for Nerd HQ has always been the panels, which seat somewhere between 250-300 fans, and is just a fraction of the audience that fills the massive 6,500-seat Hall H across the street at the San Diego Convention Center. According to Levi, that number is unlikely to go up much more, or you begin to “lose an intimacy”. That intimacy is also one of the biggest draws for the celebrities who attend as well, as the smaller crowd offers them an experience with fans like they’ve never had before. Stars like Matt Smith, Joss Whedon, Nathan Fillion, Alan Tudyk, and the casts of Psych and Robot Chicken, all have returned for panels for multiple years. “We have never had anyone not return. And it means the world. Like, when Joss Whedon says, ‘Oh yeah, I had a great time last year, I’ll totally come back and do it’, to me that’s the hallmark that you’re doing something good,” Levi said. Zachary Levi with Rob Kazinsky, Nathan Fillion and Alan Tudyk. The Nerd HQ team is always looking to expand that roster of celebrity guests. 2013 saw panels for Game of Thrones’Richard Madden, The Averngers’ Tom Hiddleston, Orphan Black, Hannibal, and a dozen new additions. Although Levi has celebrities he thinks it would be awesome to see attend — a Tom Hanks panel, anyone? — ultimately, he wants the guests that the fans want the most. “I want to bring in people that fans are going to be excited about, and just over the moon about spending an hour with. Because that’s what it’s about. I don’t care if you’re a giant A-List celebrity or you’re on some super weird, obscure, web series, but if at least 250 people are going to go out of their minds about spending an hour asking you questions, then bring it,” Levi said. San Diego Comic-Con is the perfect storm for attracting both fans and celebrities — it’s the largest pop culture gathering in North America, and SDCC draws some of the biggest names in the industry for the four-day event. Without it, Nerd HQ wouldn’t exist. It’s also the reason that Nerd HQ hasn’t fully expanded into other cities or conventions, except for a scaled-down version at New York Comic-Con. 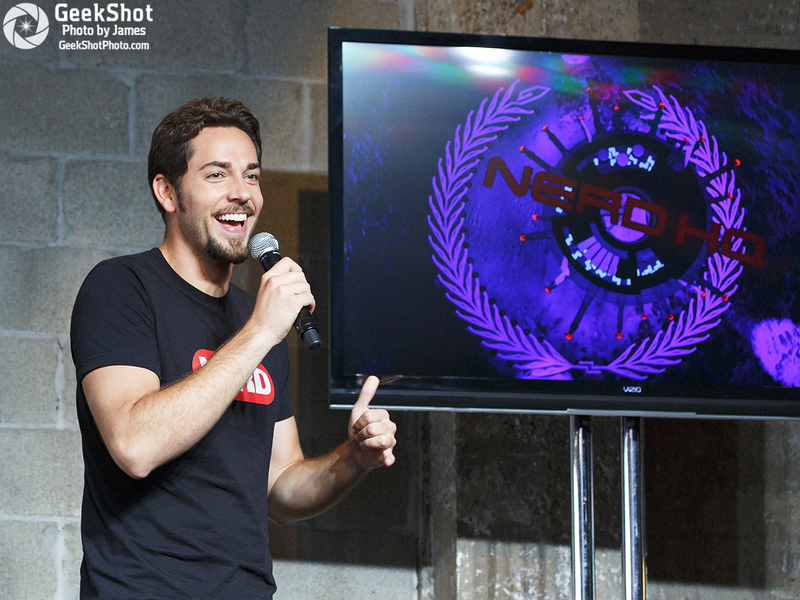 Zachary Levi during the 2012 Nerd HQ panel for Chuck. When those ingredients come together at SDCC every summer though, the experience can be “surreal”, which is exactly what Levi is hoping for. For someone obsessed with mind-blowing experiences, seeing his fans and fellow celebrities rise to his challenge on Twitter about spreading the word for Nerd HQ felt overwhelming. Levi just “really loves making people happy”, and seeing something that he created bringing so much joy to other people has been a thrill to watch. The “plan”, according to Levi, is to bring Nerd HQ back to Petco Park for its fourth year this summer over all four days of Comic-Con — with more crowd-pleasing panels, fan dance parties, more Smiles for Smiles photo booths with more celebrity guests, and more Signings for Smiles autograph sessions. Levi even has loftier goals, like earning $240,000 for Operation Smile this year, which would generate enough revenue for 1,000 Operation Smile surgeries. He’s also hoping for a potential increase in video game options in the lounge and maybe even some concerts. One thing we won’t be seeing at Nerd HQ this summer though? Kisses for Smiles, an auction for a kiss to the highest bidder, which Levi attempted one year. Fear not, Jedis! Star Wars will finally be tying up loose ends from their hit show The Clone Wars for fans before moving on to their next show, Rebels. This is another feather in Netflix’s cap as it adds yet one more original series to its ever growing streaming roaster which also includes a new season of House of Cards debuting tomorrow as well as a whole slew of street level Marvel Comics series such as Daredevil and Jessica Jones. The fan in me wonders what will come of the recently released Entire Series bluray boxset containing all of the Clone Wars seasons that aired so far. Will they release another box set titled “This is really the entire series now. We promise”? Either way I’m sure fans will be happy to see the series get a proper send off in just a few short weeks! They’re coming! 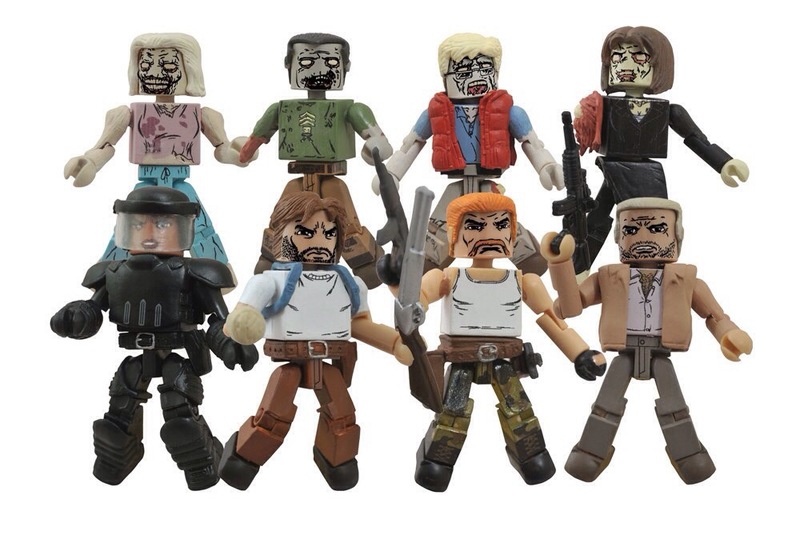 The newest assortment of The Walking Dead Minimates, based on the hit comic book by Robert Kirkman, is almost here, and Toys R Us will have an exclusive assortment of the 2-inch mini-figures, featuring an array of all-new characters and zombies! Look for both assortments this spring! Pre-order the specialty assortment at your nearest comic shop or favorite online retailer! r the folks over at CCI open up their souvenir book for art and essay submissions from fans. It is a cool little perk they open up to the public so you can really get a feel for what the average person has to show that you might not have seen otherwise. When it is open to anybody I really mean anybody. They want to hear and show what the average fan has to say, or draw, paying tribute to that year’s chosen topics. Not to toot my own horn but I actually had a (small) submission accepted a few years back and I immediately felt excited cracking that book open as I waited in the line-to-end-all-lines before getting into the convention hall and seeing my name in there. It the little things in life that really count and this is something I recommend everyone at least try once. This year’s spotlights are big ones celebrating anniversaries for Batman, Marvel, Hellboy, Daredevil, and Usagi Yojimbo! The deadline to submit your article or artwork is April 25th, and more information on how to submit can be foundhere.